My message this month speaks of the limitless covenant love of God. It is difficult for us to even think of limitlessness, but we meet the reality that God is in no way limited – with Him all things are possible. To grasp this fact is the beginning of true faith which is resting into and trusting the unlimited God. I believe this meditation will help you grasp the wonder of who our God truly is. Thank you for your prayers as Nancy and I travelled to Florida driving through the Southern states. Construction was everywhere and wrecks abounded but we were conscious of the keeping blessing of the Lord being with us. Miami is where we met with all of Nancy’s family – around 100 of them! It was a beautiful time of reunion. Miami however was a nightmare as far as traffic is concerned. We were aware of the Lord protecting us in insane traffic. We got out of Florida just as the storm came in. Thanks for your prayers. There was much to do when we got back but within a few hours we were informed that the building in San Antonio we use as church and recording studio had been shot at along with other businesses. Our glass front door was shattered and the large glass window was also shot. We are in the last stages of moving everything from there to the ranch. That is why this partner message comes to you late, please forgive me. Let me remind you of the December retreat which is now open for reservations. Space is limited so make sure to book your reservation as soon as possible. It is December 7-9 2018. The subject we will be working on and listening to the Spirit for His insight throughout the year is “Discover and Live Your Inheritance”. It will be a special retreat where we will celebrate my 80th birthday. Contact the office today and be sure to be with us. 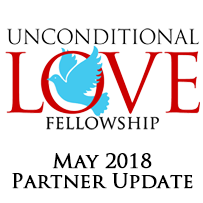 If you are on Facebook , look us up at Unconditional Love LLC - and there is a lot going on there to many thousands of excited people.